Robometricschool. - Wow, new smart technology from Samsung increasingly pamper users. 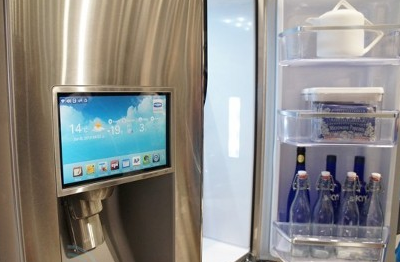 Now Samsung has been launching new smart refrigerator that equipped with Android operating system. So it make this refrigerator to be smart and joyful to use. Using smart refrigerator from Samsung that equipped with Android user can search many recipes menu and make shopping list. Android that used in this smart refrigerator will help user to do this application. This smart refrigerator also can help user to remind users will be the expiration date of food such as milk or yogurt stored in the refrigerator. Samsung give series this refrigerator with the name refrigerator series T9000. Refrigerator T9000 equipped with touch screen 10 inch with WiFi. With 10-inch screen allows users to still know the latest news, weather, view photos, even from the fridge Twitter newsfeed. T9000 also can replace a handwritten calendar with a Google Calendar integration. Smart refrigerator T9000, using Epicurious application to know recipes menu and also using Evernote application to write message. With this application, it will make refrigerator T9000 not only to be central of family and kitchen but also like table smartphone and also entertainment this time. For you who want to take smart refrigerator T9000 from Samsung must be patient because this refrigerator will to sell in the global market for several month again with price more than $4000 USD. But sadly it is not possible to install other Android apps. thank very much jack,maybe your information will give good information for other readers, do you have any solution for this problems?